You’ve always heard that you never get a second chance to make a first impression. If your smile has gotten dull over the years from drinking coffee, smoking, or just getting older, our professional whitening techniques give you results that you’ll notice immediately. A dazzling, white smile not only exudes confidence, making you feel excellent on the inside and out, but it also helps you make a lasting first impression. It’s quite likely that you’ve tried the so-called “whitening” kits from the toothpaste aisle. But they don’t deliver, so sometimes we find that patients are a bit skeptical of our professional whitening services. There are some big differences between over-the-counter whitening products and the services we provide. First off, the whitening agents that Dr. Coleman uses are much stronger. They also stay on the teeth for much longer. This combination allows the peroxide in the bleaching agent to deeply penetrate the tooth, which enables years of surface stains to be oxidized away. If you are interested in our take-home whitening trays, Dr. Coleman will start with a quick examination to make sure that you do not have any immediate issues that need to be addressed. A simple impression of your teeth will be done so that a custom set of bleaching trays can be created for you. The photo illustrates what these trays will look like. 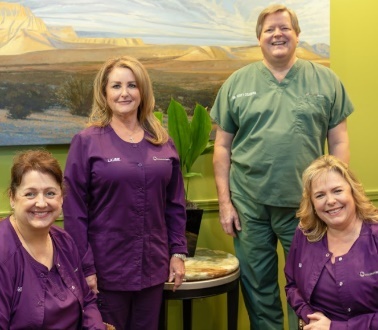 When the trays are ready, Dr. Coleman will provide detailed instructions that outline just how long and often you need to wear them with the bleaching agent to achieve your desired results. That’s all there is to it. Once you have the trays, you can continue whitening your smile for as long as you want. With professional teeth whitening, your teeth will always be whiter than they were before you started. But if you begin to notice some surface staining again as time goes by, simply repeat the process to touch up your smile. With the Zoom! whitening system, we can jump-start your brighter smile in only one office visit.This in-office whitening system is extremely effective and particularly popular with busy people because it is very convenient. A special light combined with a powerful whitening gel are used to deliver long-lasting results you will be proud to show off. Visit our Zoom whitening page to learn more. Take the first step toward your beautiful, white smile. Give us a call at 713-783-2800 to schedule your appointment today.